Sign up to Points2Shop and earn rewards through Amazon by taking surveys, watching videos, testing apps and much more! New users receive 250 just for joining! 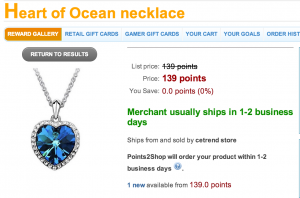 With these points you can get a Heart of Ocean Necklace for FREE with FREE shipping! Your total will be FREE with no credit card required!